San Francisco’s premier event venue features live music performances in one of the city’s most intimate settings. Fully equipped with a legendary stage, amazing southern cuisine and friendly staff, Biscuits & Blues offers a lively atmosphere where everyone gets a front row seat. Local venue Biscuits & Blues is delighted to present their newest line-up, featuring both living legends and rising stars. Encompassing a range of genres from classic delta blues to blues-rock fusion, this roster of incredible performers has something to offer every blues fan. The following list of headliners is by no means comprehensive, and all interested parties are encouraged to visit http://www.biscuitsandblues.com/lineup to view the roster in its entirety. Wednesday, March 5, legendary blues harmonica player Bob Corritore will join guitarist and singer Bob Margolin and drummer Derrick D’Mar Martin on stage. Margolin (who backed Muddy Waters from ’73-’80) has a dynamic guitar style that is complemented perfectly by Corritore’s inimitable harmonica. Thursday, March 6 and Friday, March 7, veteran bluesman Tad Robinson graces the stage. With seven Blues Music Award nominations under his belt, Robinson’s indisputable talent continues to garner him loyal fans and accolades to this day. His harmonica and vocals have earned him comparisons to some of the greatest blues musicians of all time. Saturday, March 8, the “blues lioness” herself, Sista Monica, will return to Biscuits & Blues after relentless national and international touring. A powerful contralto, Sista Monica has been performing professionally for more than 20 years and has only gotten better. Thursday, March 13, the incredible duo of Smoking Joe Kubek & Bnois King will bring down the house once again. Kubek has an aggressive, driving guitar style that is offset and enhanced by King’s mellower stylings and resonant vocals. Kubek and King effortlessly unite diverse genres on a single stage and provide a fresh take on a classic genre. Saturday, March 15, Biscuits & Blues is proud to present Kara Grainger, a fascinating Australian singer, songwriter and guitarist. With her sultry voice and fiery guitar, Grainger brings a modern energy to the classic sounds of roots, blues, and soul music. Thursday, March 20, Bill Magee will stop by to prove why he’s one of the most sought-after artists in the San Diego music scene. When it comes to audience rapport and electrifying New York/Chicago-style blues, Magee is nearly without equal. Saturday, March 22, the California Blues Hall-of-Famers Delta Wires will grace the stage. Describing themselves as “a living history of west coast blues,” their high-energy harmonica and horns set this acclaimed local band apart from the rest. Friday, March 28, renowned saxophonist Houston Person will accompany the incredible Kim Nalley. Nalley has a blistering three-and-a-half octave range that can go from operatic to gritty on a dime. She has earned comparisons to all the great female blues vocalists but maintains a style that is all her own. Friday, April 4 and Saturday, April 5, Big Daddy Cade will bring his loving B.B. King tribute to the stage. In technical ability, vocal style and unmistakable soul, Cade conjures the King himself, and his tribute is the only to receive B.B.’s personal approval. Saturday, April 12, Joe Louis Walker will tear up the stage with what the New York Times describes as “a Cadillac of a voice.” Rolling Stone simply calls him “ferocious.” This living legend has played with everyone from Hendrix to Thelonious Monk, and was once thrown off the stage by Lightnin’ Hopkins himself! Biscuits & Blues is also proud to announce that Executive Chef Emmanuel Garba has added a new item to the menu: a hearty filet of salmon accompanied with sautéed shrimp and collard greens and served over a savory rice pilaf. To learn more, please visit the Biscuits & Blues website: http://www.biscuitsandblues.com/. 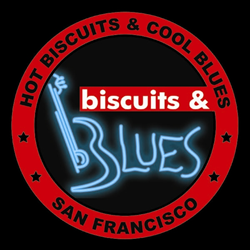 Biscuits & Blues is a full restaurant, bar and nightclub and one of the reasons why San Francisco is on the map for music lovers. Located at 401 Mason St. at Geary, they have been voted America’s #1 Blues nightclub by the Blues Foundation and the Bay Area Blues Society. It is San Francisco’s home to great live music in an intimate setting, where everyone gets a front row seat. Biscuits & Blues features savory award-winning Southern-style cuisine, California wines, micro-brews and specialty cocktails – all at reasonable prices that please tourists and loyal Bay Area clientele. Biscuits & Blues is also an event venues for parties. They can host everything from office parties to family reunions. For more information and current lineup, please visit their website.